Hardy, evergreen architectural plants, differing in leaf size, cane colour and growth habit. Enjoy rich moisture retaining soil. Avoid very dry or wet soils. Bamboos can be grown in generous containers but are greedy feeders and must not be allowed to dry out - they do not wilt, they die. All are propagated by division, this is a slow process and restricts the number that can be offered for sale. No bamboos available by mail order. Prices dependent on pot size. Thickly growing bamboo with slender canes green, aging yellow, and plenty of foliage. Good in a pot where it will remain small. Clump forming, will reach 1.8m in a decent position and with lots of feeding! Beautiful, well behaved delicate bamboo with slender purple black canes and small, narrow glaucous leaves. Will tolerate a generous container. Prefers shade, tolerates some sun. To 3m plus. Clump forming. A somewhat dwarf bamboo, with an elegant bushy habit. Plenty of slender green canes initially sheathed in pink. Small, numerous leaves. Good for containers. Prune out older stems if you want a more open habit and to reveal the colour on the new growth. Usually reaches 1.5m at most. Neat upright bamboo with slender dark foliage and golden canes, darker in the sun. Up to 3 m plus. Very elegant yellow culmed bamboo, the culms marked with alternate green grooves. Produces an open clump sporting light foliage. Up to 2m. Dark olive green culms colour to black in second year. Tidy habit and dark leaves. Prune lower branches and any spindly growth to achieve a stately clump. Best in sun. Up to 2m plus. A fantastic golden caned bamboo, with airy foliage. Tidy habit and rapid upward growth of thick canes. Very hardy. Best in open position to permit suitable admiration. Up to 5 m.
A dwarf bamboo. Slender dark culms bear broad variegated yellow and green leaves. Prune in early spring to ensure plentiful bright new foliage. Happy in a container. Mulch well for best results. Rarely reaches 90cm. 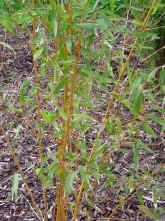 A slowly spreading, clump forming bamboo with straight canes and broad, glossy leaves. Very hardy and wind resistant. Prefers sun, tolerates some shade. To 3m. In dry soils or warm summers rhizomes can travel some distance, prune off as necessary. An invasive bamboo! Beautiful broad leaves on a medium height bamboo create a real jungle feel. Strong rhizomes allow this bamboo to romp. Enjoys an open position. Very hardy and wind resistant. In winter the leaves will bleach towards the edges, this can make the bamboo even more striking. Height to 2m. A vigorous bamboo with glossy, erect, thick green culms, and leaves branching in all directions, like an umbrella. Needs space to show itself off. Hardy, but can suffer wind burn, in a sheltered site can attain impressive heights, otherwise to about 2m. Forms a well behaved clump.